Media captionTwo men have been jailed after admitting assaulting two homeless men in a tent in Hull. A man has been jailed for four months after admitting assaulting two homeless men in a tent in Hull. 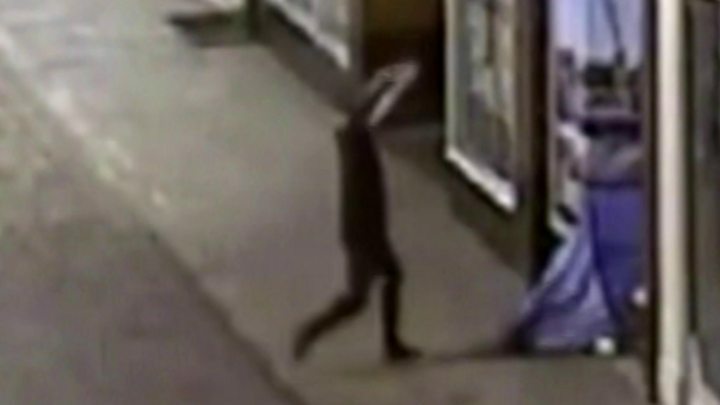 Jamie Nickell, 26 was filmed on CCTV taking a running jump and landing feet first on their tent on Whitefriargate in November. Nickell, of Goldsmith Walk, Lincoln, pleaded guilty to a single count of assault occasioning actual bodily harm at Hull Crown Court. Passing sentence, Judge Mark Bury described the attack as "repugnant". On Monday, Jake Mann, 29, also of Goldsmith Walk, Lincoln, was jailed for 14 weeks after admitting to filming the assault on his mobile phone. The court were told how Nickell and Mann, who had travelled to the city to see a concert, had been drinking and laughed in the aftermath of the assault. One of the defendants was heard to describe the men as "dirty", "scumbags", and "trampy". The attack led to one of the homeless men, Steven Cadman, suffering a minor injury to his knee. Judge Bury said he accepted that father-of-two Nickell was ashamed of what he did, noting that the defendant could not bring himself to look at the footage when it was played in court. "What you did is repugnant to right-minded people," said Judge Berry. "There are too many homeless people in our society these days. They do not need to be treated in this way."